It is a national Ukrainian dish. Ukrainian varenyky with cherry filling are tasty and nourishing. They are usually cooked in summer when people can buy some fresh cherries. However, you can make varenyky with frozen cherries as well. 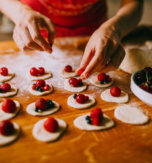 There is a long list of ingredients which you can add to your dumplings: cottage cheese, sauerkraut, mashed potatoes, boiled beans, mushy peas, fruits. 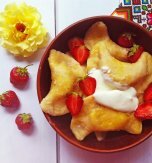 But this dish become well-known thanks to writer Nikolai Gogol, who created “The Fair of Sorotchinetz”. The author was born in a small village called Sorochyntsi, in Poltava district. 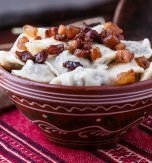 He adored varenyky so much, that described this dish with all his love to Ukrainian cuisine. Here is an interesting fact: If you travel to Ukraine, you can see special monuments with traditional varenyky. For example, Cossack Mamai statue in Cherkassy. Take a large bowl. Mix flour with water, 1 egg, salt and 1 tbsp of sugar. Knead the dough until it became tough. Leave the dough for 20 minutes and then roll it. The layer of the dough should be thin – 2-3 mm. Cut the dough into little squares. Wash cherries and wait until water drains. Add 5 tbsp of sugar and mix properly with cherries. Put some cherries (without pits) into each dough square. Beat the egg and oil edges of the squares with it. Put two opposite edges of the dough square together and cover the filling of the dumplings. Refrigerate varenyky for one hour. After put them in the salted boiling water and cook until they come up from the water. 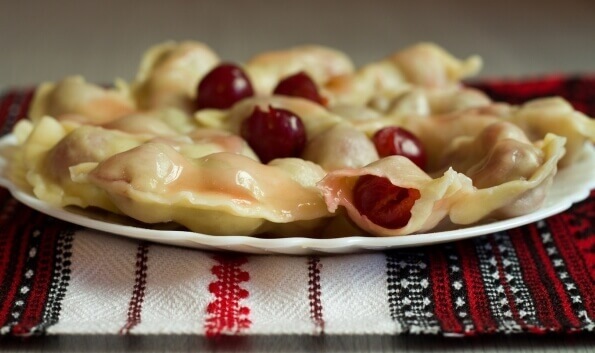 Serve the Ukrainian dumplings with cherries with the sour cream. Have you liked the recipe for dumplings with cherries?